Dale F. Eickelman's "Inside the Islamic Reformation" [WQ, Winter '98] offers a stimulating but deeply flawed analysis of current developments in the Muslim world. First, it has long been known that fundamentalist Muslims are not uneducated provincials. Since 1980, when the Egyptian social scientist Saad Eddin Ibrahim published the results of his interviews with radical fundamentalists in Egyptian jails, we have known that they are typically youths "with high achievement and motivation, upwardly mobile, with science or engineering education, and from a normally cohesive family." Second, Eickelman misunderstands the Protestant Reformation, which he presents only as "an effort to persuade people to understand and live by the basic teachings" of their religion. The enduring feature of the Reformation was to de-emphasize "works" (such as sacraments) in favor of "faith alone." Fundamentalist Islam moves in precisely the opposite direction, emphasizing the laws of Islam. Third, Eickelman dismisses violent fundamentalism as a fringe phenomenon and focuses instead on some interesting and popular books. But those books have guided no governments or powerful opposition movements, whereas the allegedly fringe extremists (including such intellectuals as Ayatollah Khomeini, Hasan at-Turabi, and 'Ali Belhadj) have. Let's call a spade a spade: the turn to Islam of the past quarter-century has been a catastrophe for Afghans, Pakistanis, Iranians, Sudanese, and Algerians especially, not to mention religious minorities across the Muslim world and the radicals' many Western victims. Like the left-wingers who once focused on the high literacy rates in the Soviet Union or the virtues of health care in Cuba, Eickelman shies away from the core evil of fundamentalist Islam and instead insists on displaying its alleged redeeming features. I regret that he does not see it as an ideological movement that thoroughly contradicts the values we as Americans hold dear; I wish he had condemned its aggressiveness and warned this country of its dangers. 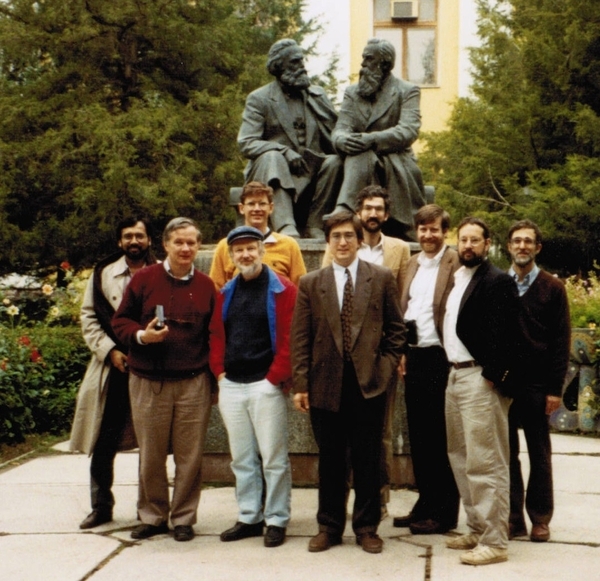 Dale F. Eikelman (2nd from left) and Daniel Pipes (4th from right) along with a Foreign Policy Research Institute group visiting Central Asia in October 1992.